Mike Daisy Was Full of It. A few months back, Mike Daisy got himself an entire segment speaking on This American Life. He talked about Shenzhen as “the place where your crap comes from”; A city of concrete and neon that “looks like Blade Runner threw up on itself”. In Mike’s dystopian Shenzhen, the sky is a poisonous mercury silver, and bowels of a sprawling highway system punch through the city only to end abruptly in a traffic cone that hangs over a 30 meter drop. Everything is bustling, toxic, and under construction. There’s one especially touching segment in Mike’s story where he meets with disabled victims of Chinese industrialization: Men who have been polishing the screens at the iPad factory, who now live with tremors. Their hands are curled up, shaking wrecks after years of handling nerve-poisonous n-hexane screen cleaners without protection. He hands his own iPad to one of them, who touches the screen in awe and says (through his translator) “it’s a kind of magic”. He’s given up his life to make iPads, this man from Mike Daisy’s story, but he’s never even seen one turned on. Funny how just as many folks on my train ride in from the airport were tapping away on their touchscreen phones and phablets as in Silicon Valley. Speaking of train rides, let me admit a prejudice: I am inclined to count a culture’s ranks in civilization in part by how clean and generous their public transit is. Are their trains to everywhere you want to go? Do they come often? Is it affordable to everyone alike? 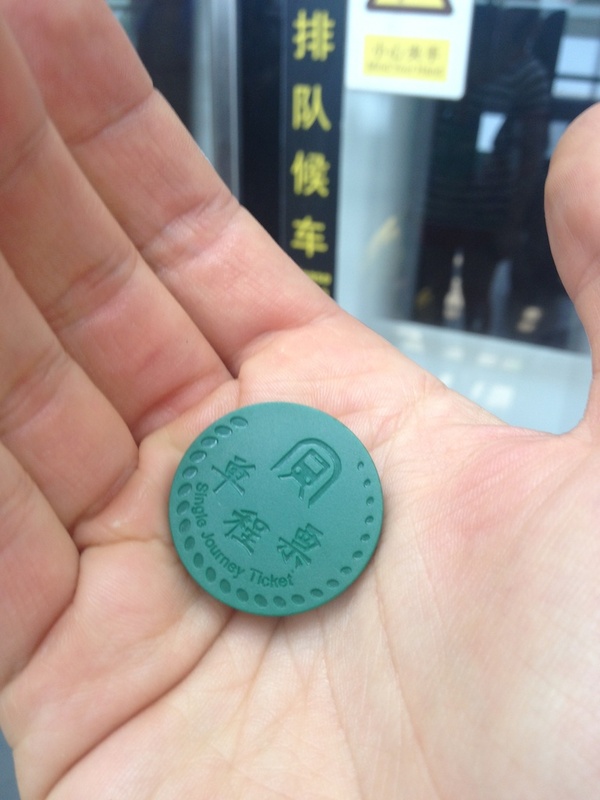 This is an especially techy tidbit: The subway tokens have something like an RFID or NFC tag embedded, so even through they’re one-ride-only, you tag them in to open the entry gate the same as you would a rail card. Then when you drop them in the exit gate from the subway system, it knows if you paid enough for the length of your ride. By this metric, Shenzhen is second only to Barcelona in civility. The trains come every few minutes. The network is vast, getting you within 10 minutes of anywhere you want to be in town. A medium-haul train ride will set you back 4C¥: About 60 cents at the current exchange rate. Above each train door is map of the line with LEDs showing where you are now, which direction you’re headed, and whether the doors on the right or left side of the train are set to open at the next stop, making using the system idiot-proof. 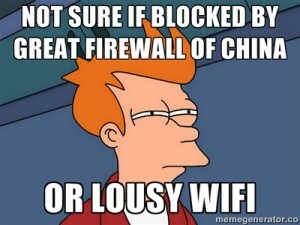 The Great Firewall? You Can’t Miss It. Other web sites (like this one) seem to run just fine. Still others are in a grey zone, loading slowly, frequently failing or dropping for minutes at a time. GMail and GChat occupy this limbo of sites that are available in China, but painful enough to use that Pavlov may suggest you prefer an alternative. Actually, I’m pretty sure it’s not the hostel’s wifi. I’m uploading these (large) picture files and getting them back just fine. I’ve been in China now for ~24 hours now, but I’ve just got my feet: Overnight in Beijing International Airport after my first connection to Shenzhen was cancelled, wandering across Shenzhen to a new hostel after the first one I’d reserved a room at had given it away when I didn’t show, sleeping until a few hours before dawn to catch up, pulling WhereAmI.org out of mothballs and then writing this blog post. Time to find my feet for real: To find the local Makers, techies, coffeehouse addicts, and the rest. Also, I need to get my own phone turned on to this network, lest I shatter every notion that the locals have of Americans as being affluent movers and shakers. Because clearly, to the people around me, anyone who isn’t tied to the ‘net at will is at best a primitive cretin. What? There’s a high correlation between boardgamers and other species of nerd. Also, of note: Check out how googling “board game store shenzhen china” turns up the majorities of its entries over the water, in Hong Kong. Comments are turned on in this blog! You should comment! Especially seeing as how I can’t keep up with you through Facebook or the like right now! Curious how ye olde livejournal.com gets through the firewall. When I was there ten years ago (!) the level of cyberparanoia was much lower. Odd indeed, that the censors would skip that one. I was askin’ if you can see LJ now, not sayin’. Back then it was no big deal. Your subway token, by contrast, looks like the sort of thing I would reflexively throw away, same as I would most of the random pieces of plastic my kids drag in. 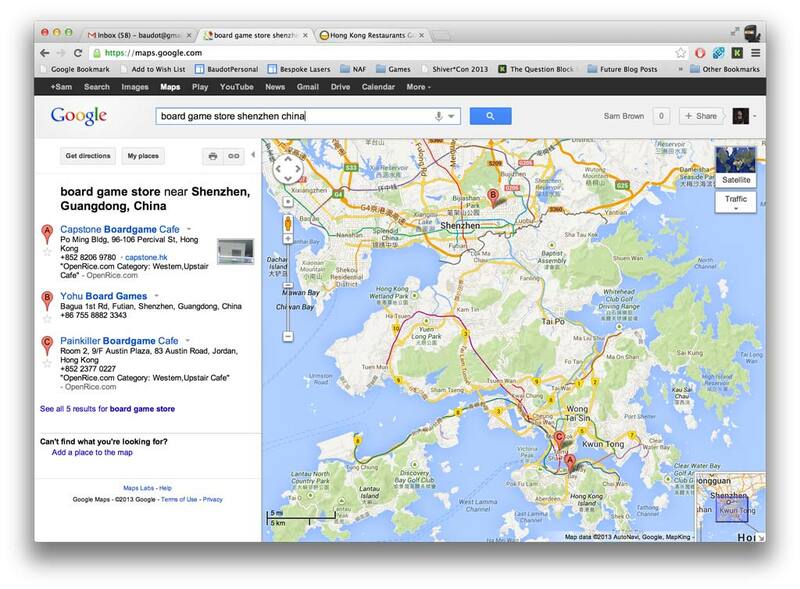 Will you be staying in the Shenzhen area the whole time, or traveling around the country? Hong Kong? 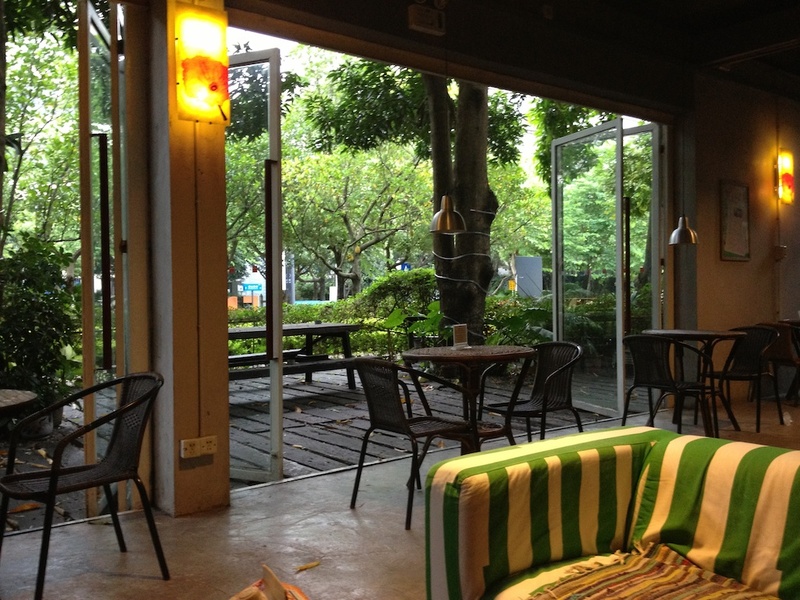 I’ve found out in the last day that my hostel is indeed abnormally nice, as is the neighborhood. I’m in the “OCT” area: Overseas China Town. I guess it’s meant to be expat-from-expat community, just from the name. On the downside, being an affluent area, it’s also much more expensive than regular China. You can easily pay American prices for meals and coffee here, though there are very cheap hole-in-the-wall places if you keep an eye out. Also if you accept that anywhere that turns over that many breakfasts and lunches that quickly has to be doing something right, and wouldn’t have that kind of business if they were giving their customers food poisoning. Because these hole in the wall places don’t have the look of cleanliness. But they sure are tasty. And an 80 cent breakfast or a 2-buck lunch are hard to beat. So far at this hole in the wall place, I’ve had a breakfast of something kind of not really crepe-like. It started life as a ladle full of what looked like rice starch broth, poured this onto a cooking sheet. An egg gets halfway stirred in and the whole tray gets slapped into a hotbox where it cooks for just a few minutes: quick enough that it comes out a little soft, like well scrambled eggs. That gets scraped off onto the plate in a slapdash way that, together with the egg-half-stirred in gives it some variety and texture. The process is repeated a second time to pile the plate higher, and then sauce is poured over the top. If I’m hearing correctly, the dish is called “Chang Fe”. It’s hearty, and kinda gloppy. Overall yummy and satisfying. My lunch was less remarkable: “Japanese Style” tofu. Just medallions of tofu with mushrooms in oyster sauce. Not too different from what you’d find in an Americanized Chinese restaurant, except that the texture of the tofu was very delicately handled: It had just a hint of “skin” to bite through, then the inside was soft and hot. Again, simple and satisfying. This version looks far more prettied up than the sloppy-but-delicious hash I had on my plate this morning. The image in that link is like a perfect omelet, compared to a pile of scrambled eggs. Google tells me that cheong means intestine, so with proper selective translation, this meal is intestinal fun. That’s my kind of breakfast. very cool to read this. are you neglecting email now too? I can reach eMail. It’s just social networks like Facebook and Twitter that are blocked by China’s “Great Firewall”. The Great Firewall doesn’t like gMail much, but usually lets it through, slowly.